Installing French patio doors adds a touch of elegance and an interesting architectural element to your home. Choosing French doors that lead to your patio is different from choosing interior French doors because the patio doors are exposed to the elements, which, if you live in a cooler climate, can be extremely harsh during the winter months. Here is a simple breakdown of different types of construction for French doors. Wood: If you're considering wood-framed patio doors, make sure the wood is kiln-dried so it will withstand the sun, rain and snow. Almost all exterior wood doors are well constructed and not prone to cracking or shrinking. Over time, though, they will require new coats of stain or paint. Vinyl: This option makes for easy cleanup and it's very durable. Vinyl doors come in a wide variety of colors. Vinyl doors are very durable, but are still susceptible to scratches and dents. 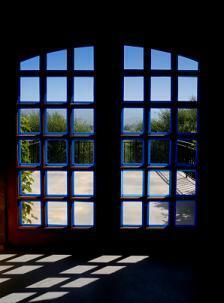 Glass: Make sure the glass to your patio doors is double paned with Low-E if you live an area that has harsh winters. Here are a few places for you to browse online to get a better idea of the type of French doors available and what you can expect to pay for them. Anderson Windows: On this site you'll see the basic framework and then options such as art glass, sidelights and transoms from which to choose to customize your doors. Anderson also makes custom French doors. Milgard: This company specializes in wood-framed French doors but offers fiberglass doors as well. Milgard offers French doors with up to four panels. Doors 4 Less: These doors are priced per panel, but still cost significantly less then other French door dealers. Lanai Doors: If you love the look of French doors but don't want have the extra space for them when they are open, choose a Lanai door. These doors look exactly the same as French doors, but are bifold doors so they take up a minimal amount of space when opened. Get a partner. Most French doors are delivered to you in their casings. These are referred to as pre-hung doors. Needless to say, they're heavy and besides, it's just about impossible to get the door hung right without having someone help you because it doesn't sit on the ground when you are attaching the hinges. Get the right sealer. Sealer is not a place to skimp when installing French doors that lead to the outside. Make sure the sealer you buy provides adequate protection against the outside elements. Don't forget to add the insulation around the door opening. Remember that insulation needs to breathe, so pack it in there firmly, but not too tightly. Leave a little space for movement. When installing French doors, be sure to leave at least three-eighths of an inch at the top and side so of the doors to allow the materials to expand and contract. The biggest advantage of installing French doors that lead to your patio is that they let a ton of natural light into the house. They also look beautiful from both the inside and outside of the home. There is no need to worry about safety either as these doors have multiple inside latches to ensure that they cannot be opened from the outside when latched. The only drawback to speak of really is that if you have kids and pets, the glass on the doors may more often than not be covered in paw prints (from both kids and pets) so they'll require frequent washing if you mind that sort of thing.